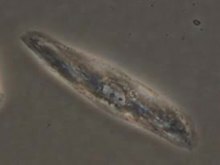 Video of a single beating cardiomyocyte, taken from an open-access article co-authored by Yamanaka. Isolating cells by cell type is an important step in stem cell therapy. Shinya Yamanaka (山中 伸弥, Yamanaka Shin'ya?, ojoibi September 4, 1962) je onisegun ara Japan ati oluwadi nipa awon ahamo onihu agbalagba.